There are three bedrooms and the Farmhouse can sleep up to 5 people in 2 x double bedrooms and 1 x single bedroom. There is just one bathroom in the house which is upstairs along with the bedrooms. It has a shower only (no bath). Downstairs is a guest toilet. The kitchen is fully fitted with all modern appliances along with a washer/dryer. The main sitting room has a cosy open fire, a 3 seater couch and two armchairs along with a selection of toys and games for children. 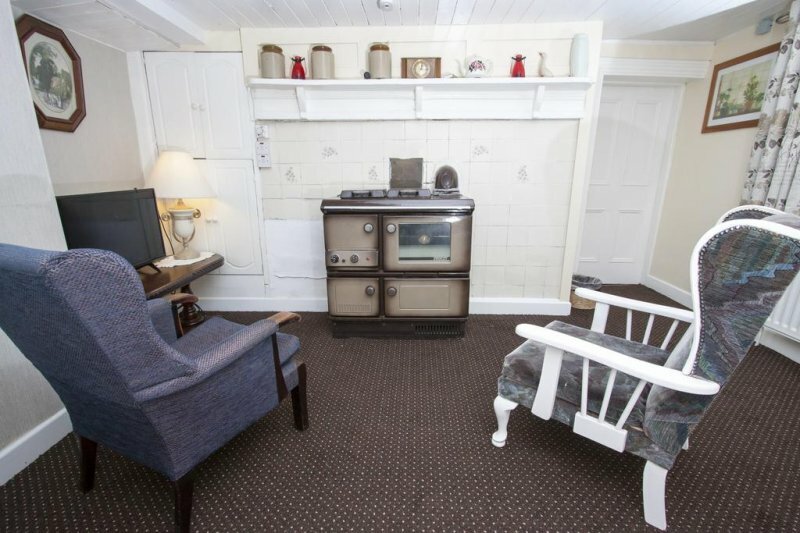 There is no TV in this room however WIFI is available throughout the house free of charge during your stay. There is a smaller living room with an oil-fired stove, two armchairs and a bench for sitting on. This room has a TV. The dining room is to the front of the Farmhouse and has wonderful views over Lough Arrow below and the surrounding mountains. It has seating for up to 8 people along with a welcoming open fire. There is plenty of parking and a private garden with goal posts - ideal for keeping children entertained. The views from the front of the house really are beautiful and it is the perfect place to while away an evening. There are lots of things to see and do in this, one of the most beautiful, unspoiled and largely undiscovered parts of Ireland. Go fishing on Lough Arrow or cruising on the River Shannon. Play a round of golf on one of the many golf courses around the area. Walk on one of the Way Marked Routes which will take you through the fields to see the flora and fauna and enjoy the fresh air while enjoying some of the most beautiful scenery in Ireland. • Lough Arrow 1KM: Fishing, water activities, boat hire, site seeing. • Over 5000 recorded archaeological sites in Sligo alone: The Labby Rock, Carrrowkeel Passage Tomb, Heapstown Cairn and Ballindoon Abbey are all within a few kilometres. • Tree Canopy walk, Adventure Play Kingdom, Boda Borg • Shannon Blueway 20KM: The First Floating Boardwalk in Ireland between Drumshanbo and Carrick on Shannon. Part of an expanding network of recreational trails that offer walking, Kayaking, and Cycling along the Lough Allen Canal and River Shannon. Tree Canopy walk, Adventure Play Kingdom, Boda Borg. • Strand Hill Beach 30KM: Surfing, Sea Weed Baths, Walking Trail, excellent choice of restaurants. • Arigna Mining Experience 18 KM: Underground tour of the old mines, The Miners Exhibition Centre and cafe, The Miners Way Walking Trail. • Sligo City. 30KM: Shopping, Good Food, Cinema, Theatre, Walking Trails etc.